Which Grains Can Be Steeped? Which Need Mashing? For beginning brewers, it can sometimes be hard to tell whether a given grain requires mashing or whether it can be simply steeped in water of the appropriate temperature. Mashing is necessary when the grain doesn't contain sufficient enzymes to convert its starch into sugars yeast can consume. Steeping those grains without exposing them to the necessary enzymes will contribute starchy flavors to the finished beer and will reduce the alcohol content. The lists below have been compiled from sources believed to be reliable, and tell you which grains must be mashed in order to convert their starches, and which can be steeped or mashed. Long steeping periods (45-60 minutes) can often achieve the effect of a mash provided that grains included in the steeping contain the necessary enzymes. Corrections and additions are welcomed. Please note them in the comments. I suspect that most home brewers are drawn to the hobby when they taste a craft beer and wonder how it was made, or how it might taste if the recipe was altered slightly. This kind of curiosity drives us to seek out recipes that come as close as possible to our favorite craft beers, so that we can reproduce or improve upon that brew. Clone Brews by Tess and Mark Szamatulski is an excellent resource in that quest. 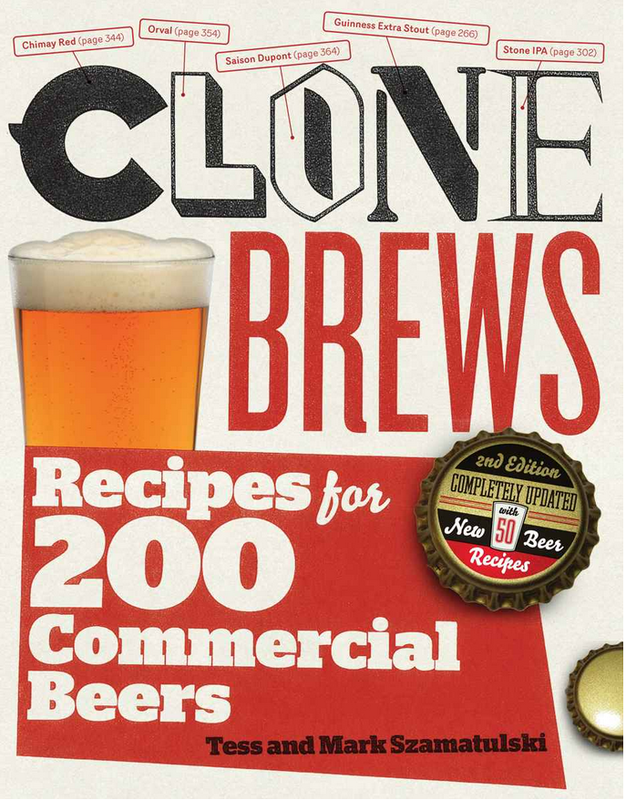 They run a home brew shop and spent many hours working out recipes to clone 200 of their favorite beers, sharing those recipes in this book. 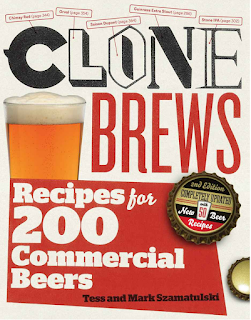 Among the 200 recipes in this book, you'll find clone recipes for Grolsch Premium Lager, Ayinger Celebrator Doppelbock, Samuel Smith's Winter Welcome, Traquair House Ale, Sierra Nevada Pale Ale, Moose Drool, Dragon Stout, Dogfish Head 60 Minute IPA, Lagunitas IPA, Aventinus Wheat Doppelbock, and more. Being a fan of Belgian and Belgian-style ales, I was particularly impressed with that section of the book. In it, I found recipes for clones of many classic Belgian beers, including Hitachino Nest White Ale, Affligem Abbey Tripel, Scaldis Noel, Chimay Red, Duvel, Gulden Draak, Unibroue La Fin Du Monde, Orval, Trappist Rochefort 8, and St. Bernardus Prior 8. The book begins with a discussion of how you might go about cloning a beer that isn't covered in the book. It talks about information sources that will help you nail down some of the ingredients in the beer. For each recipe, the authors provide a description of the beer being cloned, followed by specifications for the beer (including its style, the recipe yield, original gravity, final gravity, IBUs, SRM, and ABV), serving notes and food pairing ideas, and brewing instructions. Brewing instructions include the ingredient list and amounts, times and temperatures, and all the details you'd need to brew the beer yourself. Recipes for all-grain, mini-mash, and extract brewing techniques are included as well. Most of the recipes are simple to follow, much like those in common ingredient kits. A few require the use of more-advanced techniques like roasting your own grain, caramelizing or reducing part of the wort, and so on. Serving Notes: This ale is ready to drink 1 month after it has carbonated. It will peak at 3 to 7 months and will keep at cellar temperatures for 9 months. Serve at 50 degrees F in a goblet. Food Pairing: Serve with bacon-wrapped red snapper, along with shiitake mushrooms and celery root in an herbed beurre blanc and Chimay Red sauce. Ferment and Bottle: Ferment in the primary fermenter for 7 days or until fermentation slows, then siphon into the secondary fermenter. Bottle when fermentation is complete, with 1 1/4 cups of Muntons wheat malt boiled in 2 cups of water. So far, I've only brewed two of the recipes from the book. My first was the Gulden Draak recipe, which turned out quite well. I wouldn't say it's an exact match for the original, but then I wasn't able to get exactly the right malt for one of the malts and couldn't get one of the hops listed in the recipe. That may have made the difference. The other recipe I brewed was the Bush de Noel (Scaldis Noel) clone. That beer requires at least seven months of bottle conditioning before it's ready, so I won't know until later this year how it turned out. I'm looking forward to trying some of the other recipes in the book, such as La Fin Du Monde. Watch this blog for the results of those experiments. Can a shorter boil be superior to a long one? A beginning home brewer friend of mine asked a question that sounds like it should have a simple answer, but the answer isn't quite as simple as it seems at first glance. His question: "I'm brewing a light-colored beer (a Kolsch). I want to be sure it doesn't come out too dark. Should I limit my boil to only 20 minutes?" The gut reaction when you hear this question is to say "No. Boil for the full 60-90 minutes." After all, boiling is important to breaking down proteins and making sure that you get the full bitterness from your hops pellets. If you're doing an all-grain recipe for a light-colored beer like this, you probably want to do a full-size, full-length boil to ensure you get a good result. An extract-based recipe changes the answer a little. Malt extract doesn't generally need a full-length boil. It's basically just a concentrated, already boiled wort. You want it to boil for about 15 minutes to ensure that any bacteria or other nasties that might ruin your beer get killed, but boiling for 60 or 90 minutes isn't strictly necessary. In fact, boiling a pale malt extract for too long can cause a Maillard reaction (sometimes referred to as caramelization) that can alter the flavor and color of the beer. A 60-minute boil on an all-extract Kolsch might result in a light-brown beer instead of the familiar yellow or gold color. It might also be annoyingly sweet for the style. For a light-color, all-extract boil, I might very well not boil the extract for the full length. For a light-colored recipe that includes some specialty grains, I might take a slightly different approach. I'd steep the specialty grains as directed by the recipe. Then I'd bring it to a boil and include my hops pellets. If there are other non-extract components to the recipe, I'd add those as directed as well. Then, during the final 15 minutes of the boil, I'd temporarily remove the kettle from the heat, stir in my malt extract until it's dissolved, and bring the wort back to a boil with my wort chiller inside. That would kill off anything that might be in the malt extract (or on my wort chiller) that could ruin my beer. As soon as the boil was over, I'd get the kettle off the heat, then use the wort chiller to bring the temperatures down as fast as I could to minimize any Maillard reaction. But a 20-minute boil can be the right answer. If you look in homebrew supply catalogs, you'll see 20-minute boil kits. These usually include malt extract with few other ingredients. These are usually lighter-colored all-extract (or nearly all-extract) recipes. If you want to adjust from a 60-minute boil down to a 20-minute boil for an existing recipe, you'll need to keep an eye on the bittering. The Beer Tools Pro software says that if we boil the DME and hops for 60 minutes, we'll end up with a bitterness of approximately 20.6 IBUs, a color of 5.2 SRM, an original gravity of 1.054, and a terminal gravity of 1.013. Realistically, there's a chance that if we boil that light colored DME for 60 minutes we'll brown it up a bit and miss our desired color. What happens if I dial that back to a 20-minute boil? Beer Tools Pro tells us that we will now end up with a bitterness of only 11.5 IBUs. If our goal was 20.6, we're going to need to add hops pellets to get the recipe back on track. How much more? Beer Tools says we'll need to increase from 1 ounce to 1.79 ounces to maintain the same bitterness level. Changing the boil time down to 20 minutes also means that more of the aroma compounds of the hops will survive the boil, perhaps altering the aroma of the beer slightly. So the answer to the question of whether a 20-minute boil is the right choice or not depends on the style of beer you're making, the color of the finished product, and the amount of extract in the mix. A 20-minute boil probably won't work well for an all-grain stout or porter, but it might be ideal for an almost-all-extract wheat beer, Kolsch, or light beer. All-grain brewing, with properly controlled temperatures during mashing and sparging, can produce excellent results. But all-grain brewing isn't right for every brewer, in every circumstance, for every recipe. Extract brewing (especially when combined with specialty grains) can produce great beer in a fraction of the time with a smaller investment in equipment. This makes it the right option for many home brewers. We'll talk a little more about these now. Liquid malt extract (LME) can go stale much more quickly that dry malt extract (DME). Once opened, LME will usually go bad more quickly than DME, but both will begin getting stale. This can produce off flavors in the beer. In fact, given its poor shelf life, you'll want to avoid LME in your recipes whenever possible. It's also important to make sure that you add extracts at the right time during the boil. If you're trying to brew a lighter-colored beer like a Kolsch or a Belgian Tripel, you'll want to add extracts late in the boil to ensure that they don't scorch, burn, or darken. Since most dry or liquid malt extract is basically sterile at the time of creation, it shouldn't be necessary to boil it longer than about 15 minutes. The older the extract or the more time it's been exposed to the air, the more you'll want the boil time to be around 15 minutes. When using any malt extract, liquid or dry, keep in mind that it's important to use extract the right way. You're better off using a pale LME and specialty grains than a darker LME. The specialty grains may slightly increase the complexity of the recipe but will usually yield better results. Speaking of specialty malts, be careful about over-using them. If a recipe doesn't call for a particular kind of specialty malt, leave it out unless you're experimenting with a recipe of your own. Some specialty grains don't work well for steeping anyway, because their starches haven't been converted to sugars by enzyme activity. Learn about partial mashing as well. This can be a way to add many of the flavor components associated with all-grain brewing to what is essentially an extract beer. Partial mashes are only a little more complicated than steeping specialty grains. They require a little bit more temperature control and time management, but for the most part work the same way. All this being said, don't cut corners. Think of malt extract as a way to simplify the mashing and steeping process by eliminating the need to mash a large amount of grain. Don't see it as a direct replacement for using the appropriate types of grain for the recipe you're making. You also want to make sure that your boil times, gravities, and temperatures line up with the recipe whether you're using grain or extract. If you're worried that your extract beers aren't turning out well, before jumping into the all-grain process, invest your time and money in improving your existing equipment and techniques. Work on temperature control during mashing, sparging, and fermenting. Get a kettle large enough to do a full boil. (This will also help with hop utilization.) All of these tools will help improve the quality of your extract beers, and place you in a better position to do a good job with your first all-grain brews later on. The April 20, 2015, issue of Chemical & Engineering News (C&EN) carried an interesting article about Yeast. The publication is normally only read by scientists, but I was able to acquire a free copy and read the article. Most, if not all, of the information in this post comes from that article, entitled Tapping Yeast's Genome by Matt Davenport. The article features the Colorado brewmasters Keith Villa (of Blue Moon Brewing) and Max Filter (of Renegade Brewing Co.). Davenport tells us that "Yeast are perhaps the best understood organisms on the planet." Scientists have studied yeast for years, and with DNA sequencing equipment coming down in price, they are gaining even more knowledge about it. If you're reading this blog, you know that yeast are the main workhorse ingredient in home brewing. Yeast consume the sugars in beer (and some of the fatty acids from hops! ), and give off alcohol, carbon dioxide, and a few esters that can improve the beer's flavor. Scientists think humans stumbled onto the fact that yeast produce alcohol by accident, perhaps eating a fruit that fell off a tree and naturally fermented, or grain that got wet and fermented in a jar. Since then, brewers have spent their time learning what makes yeast healthy and productive. In the process, they began selectively breeding yeast to develop strains that delivered the flavors and qualities they wanted for beer and wine. Avery Brewing Co. produces about 30 different kinds of beer, many of which use different yeast strains, in the same equipment. There is a concern that a yeast strain from one beer (like a Belgian wit or a German hefeweizen) might not be completely cleaned out of the fermentation tanks when a different beer (which uses a different yeast) is brewed in the same vessel. This could result in the beer having an "off" flavor (e.g., an IPA with banana and clove flavors), and might require Avery to dump the entire batch. They'd prefer not to have this happen. One way they're doing this is to work with the university to uniquely identify all their yeast strains. These "fingerprints" will be used to help the brewery determine if an IPA contains yeast from another beer style (hopefully before the contamination ruins the batch). Something else scientists are doing is using biochemical tricks to block each gene in the yeast in order to figure out its function in the organism. This will eventually enable them to begin producing "designer yeasts". They've already managed one modified yeast that produces significant amounts of a banana flavored ester. The brewer who tried using a batch of it said that it created a beer that tasted like a banana milkshake. However, given that many people are averse to eating genetically modified food products, they don't plan to make the yeast available for use at this time. It's being cryogenically stored for the future.